It’s almost magical how Vocre works; Speak into the app while your iPhone is vertical, flip the phone horizontal and the phone’s accelerometer cues the app to translate and speak what you’ve said into the language of the people you’re speaking with, they then can respond, rinse, repeat. To use Vocre, select the language and the gender of the person you’re going to be talking to, and Vocre does the rest. Vocre uses Nuance to convert speech to text and its own crowd-sourced machine learning technology to go beyond to the pitfalls of Google Translate to make that text intelligible. Then iSpeech re-converts the translated text back into audio. Vocre aims to make interaction between users who speak different languages seem somewhat natural. The app monetizes through subscriptions and every new download comes with 10 free translations. Afterwards users can get another 10 translations for an extra 99 cents. myLanguage, the company behind Vocre, plans on utilizing the in-house translation technology in order to add phone call and text features in the near future. Vocre currently is available in the US App Store in 9 dialects including English (US, GB, AU), Spanish (Spain), French (France), German (Germany), Italian (Italy), Japanese (Japan) and Chinese (Mandarin/China). While right now phones need to be set to American English in order to use the app, Vocre plans on adding support for around 40 or so more languages over the next year, Lauder tells me. 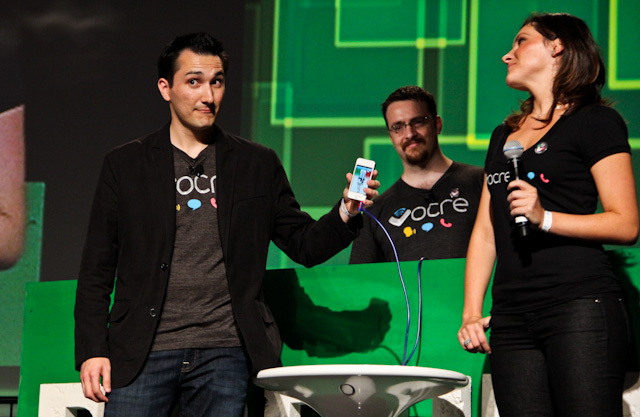 Vocre currently has $50K in seed funding. A: It won’t pick up fake accents. R: What’s the turnaround time? A: It’s quick, but we’re actually doing a three step process to translate so you’d think it would take longer. MS: If this really works, it’s great. You have to work hard to keep the middle part differentiated since the first part is controlled by Nuance and the second part is controlled by iSpeech. The thing with language is that idioms don’t translate that well. WC: The situation where this comes in handy is a cab driver giving directions. How does this work when you don’t have a data plan? A: Without a data plan this doesn’t exist. It doesn’t use a ton of data, but it’s there when you need it.